The Parent’s weekend sale was a fantastic event from EVERY perspective that one can possibly think: we would like to say THANK YOU to every participant who made this an unforgettable sale. At times there were up to 20 volunteers at a time in the room! 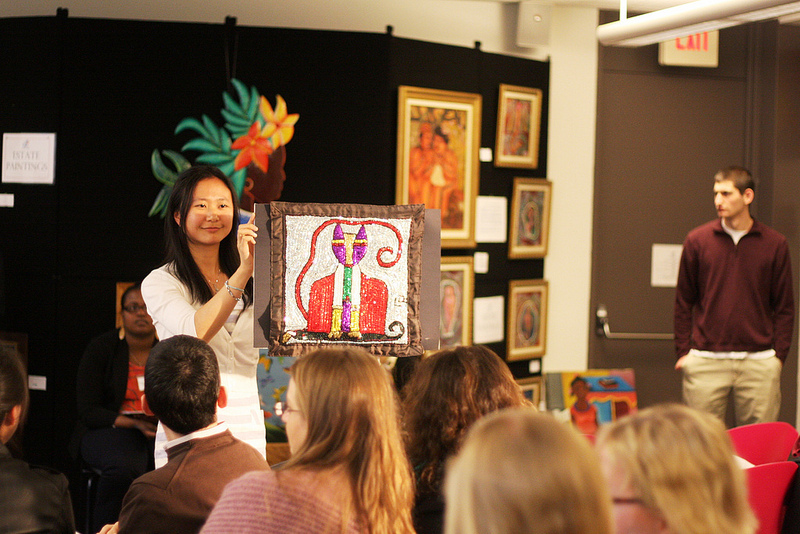 We would also like to say thank you to all the alums who came back to help: Claudia Sanchez, Samin Shehab, Emily Strasser, Tian An Wong, Kristen Meade, Debbie Pham, guest alums Katie Interlichia and Jerry Giloigan, who bought their first Haitian ptg. ever, and Livia Dinu!….It felt like home having you all with us. We made enough money to insure another year of education at our school in Chermaitre. The amount that we raised means one meal a day for students, a year of teacher salaries, uniforms and books for the students in the school. Our recent trip to Haiti gave way to many more very important initiatives which now have to be implemented. Given our team, and our generous customers, everything is possible….ti pa, ti pa (little by little)… WE have so much more to do! The level of ownership of duties was unsurpassed this year. The passion that we received from our audiences are gorgeous. We are so proud and grateful to you for all you do, for your great ideas and for your energy and passion that keeps us all A L I V E!!! It wouldn’t have looked the same if any pieces of the part was missing. 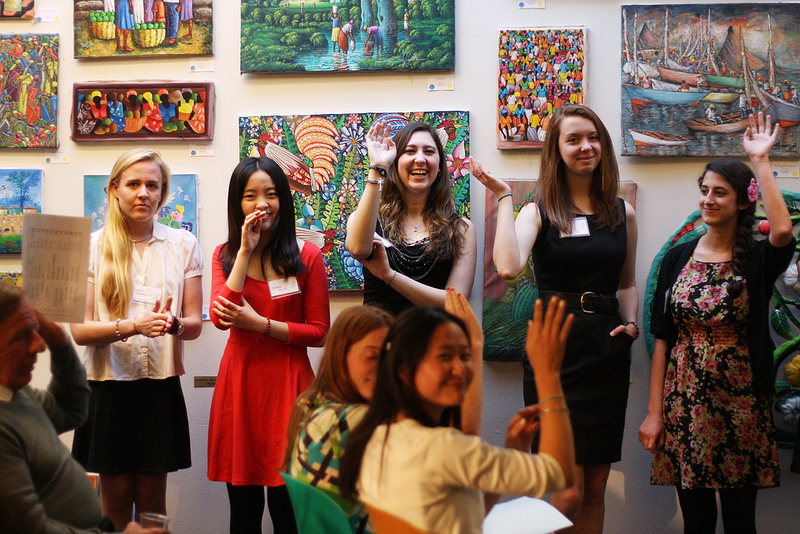 During the auction, all VHP volunteers raising their hands to show the efforts they put in. The beautiful room decorated by Haitian art and crafts. The April Sale is one of the most demanding yet rewarding events that the VHP plans throughout the year. It is a wonderful occasion to engage with the Vassar community, since it takes place in the heart of the campus, and also because it coincides with parents’ weekend. 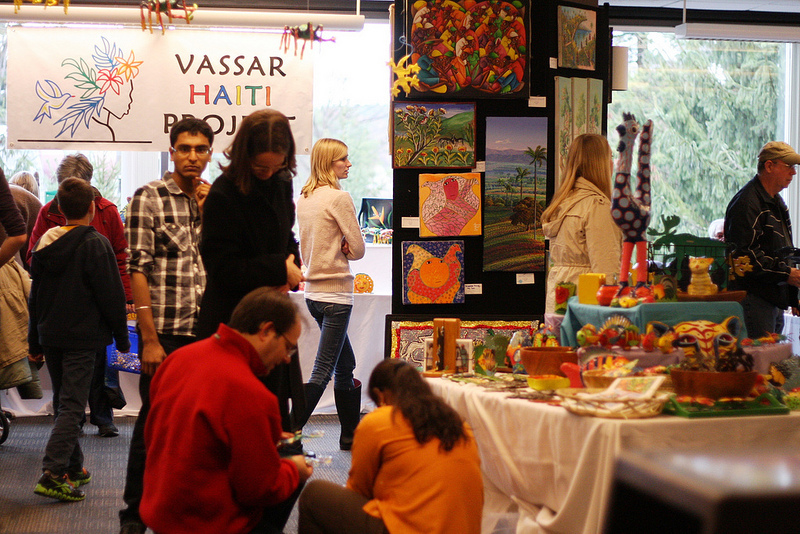 Many volunteers take this sale as a chance to share the VHP with their families and loved ones, and Vassar students who are not usually involved with the VHP can also experience how our organization works first-hand. It is however, a very demanding event, as it spreads over three days, it includes an auction, and because we rely on our April Sale to provide the funds necessary for the year-long functioning of the Education Initiative in Chermaître. It is through the efforts of our many volunteers and thanks to the incredibly generous support of our community that we are still able to pay teachers’ salaries and provide a daily warm lunch to the children enrolled in our school. 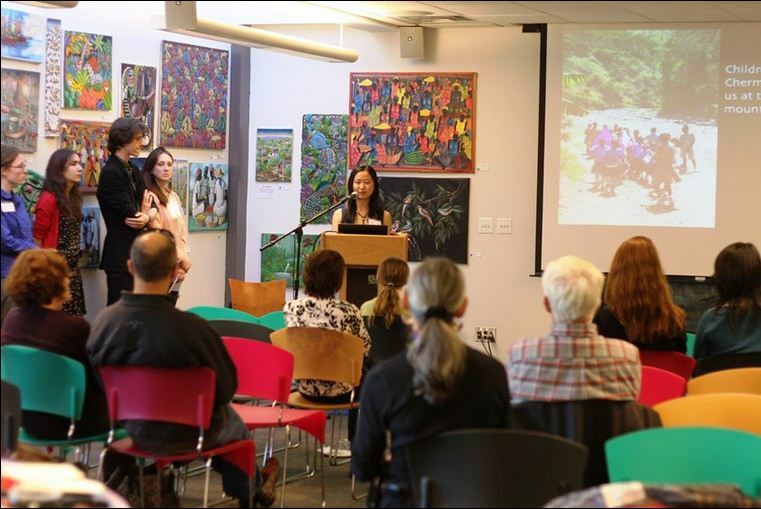 This event is usually my favorite event that the Vassar Haiti Project organizes, but it held an even stronger meaning for me this year, after I returned from our trip to Haiti. Throughout our stay in Chermaître, I engaged in conversations with the teachers, and I was deeply moved by their desire to provide the best education possible to their students. They were very open and welcoming, and they shared their ideas about how to improve the school. Every time the VHP visits Chermaître, we realize that there are many more things that can be done in the village, and we rely on the expertise of our partners in Chermaître to guide us. The teachers are an excellent source of information, because they know the community quite well, and because their close relationship with the children ensures that they are always aware of the most stringent needs of the families. Among some of the issues we discussed with them were how to improve the children’s nutrition, and also how to encourage the continuing education of teachers. We have succeeded in providing a basic education to many children in Chermaître, and for that we are incredibly grateful to our patrons. However, the education initiative does not end with the construction of the school building, but continues for many years to come. During our stay in Chermaître, the structure that served as the kindergarten collapsed, and we now have to think about how we can build a new, safe building for our youngest classes, which are also the most numerous. We need to keep thinking about how to ensure that the children are healthy, as well as educated, and for that we need to take a closer look at their nutrition. We need to make sure that the teachers have the best resources available, so that they are able to do their jobs to the highest standard possible. The funds that we raised at the April Sale go towards such projects, and it is worth remembering that even the smallest support goes a very long way in Chermaître. Thank you to everyone who came and to all the volunteers that gave so many of their hours to this event. It was great getting to meet you all!